What Does It Mean When Your Dog Yawns? What does it mean when your dog repeatedly yawns? Are they just tired? Perhaps, but there are many possible reasons for repeated yawning and it can signal different things. Yawning was thought to be a way to replenish oxygen to the brain, but more recent studies have found it to be a means of communicating. 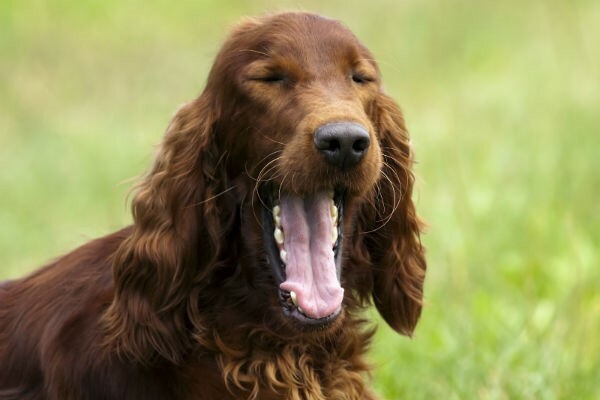 Often you will notice that your pup yawns when they are in a stressful situation, such as: a visit to the veterinarian’s office, traveling, getting groomed, or visiting an unknown place. The act of yawning is used as a calming signal for themselves, but also to let you know they are not comfortable in the situation. Conversely, being too excited in a positive situation or place can also trigger yawning. The over excitement is also a stressor to their system and the yawning is a way to calm themselves down. If you find your pet yawns often and it is stress induced using Psy-Stabil can help. It is a gentle calming formula for both dogs (and cats). It works over time to help your stressed pet “cope” better with triggers that cause anxiety. The yawning may also be communicating indifference to a situation. It has been observed in both domestic and wild canines that they will yawn to diffuse a situation. If your pooch is an alpha dog, yawning is a signal to calm other dogs or in the case of a submissive dog, it may to show they do not want to engage. We all do it…one person it the group yawns then the entire group follows. Dogs also respond to other dogs yawning, but most interesting is that they will also respond to human yawning, especially if it is someone well known to them.